Korallen-Zucht Coral Snow liquid filter media as well as a secondary biological facilitator for elements and nutrition. Increases the effectiveness of other KZ products such as B-Balance and Potassium-Iodide/Fluoride Concentrate. Compatible with Amino Acids and Coral Vitalizer. This is primarily a secondary biological facilitator for other Korallen-Zucht products like Amino Acids Coral Vitalizer, B-Balance and Potassium-Iodide/Fluoride Concentrate. 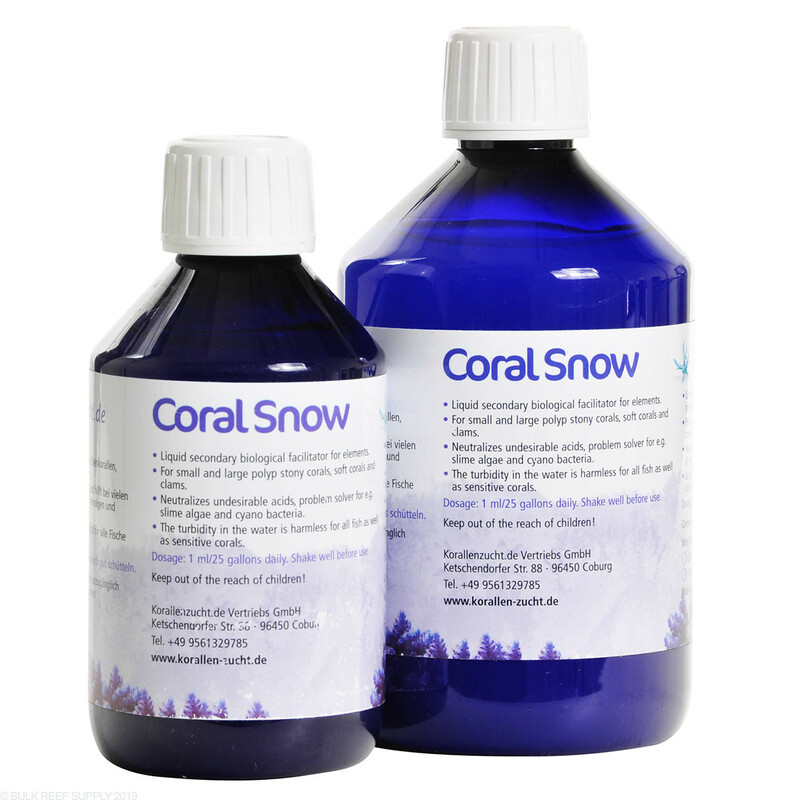 Dose Coral Snow 1 mL per 25 US gallons every day mixed with a different product to enhance results. Combine the desired amount of Coral Snow and additive, rest for 5 minutes then add directly to a high flow area of the tank. Initial cloudiness is normal and not harmful. After initial cloudiness disappears you will notice the water is extremely clear, very similar to when fresh activated carbon is added to the tank. Do not exceed recommended amount. To help eliminate cyano bacteria add one drop of ZEObak per 25 gallons of tank water to Coral Snow. Dose every two days until cyano bacteria is gone. Coral Snow and Zeobak are Korallen Zucht products that can be used as standalone products. I've used it in the past to 1. feed my corals,2 improve water quality and 3 to get rid of nuisance algae/cyano. In my previous use, I could not attribute whether or not my corals benefited but there was no appreciable improvement in water clarity and there was no decrease in microalgea. Recently, I had a Cyano attack in my display (38 gallon) and tried using the Coral Snow and Zeobak again. After several weeks of dosing them there was no improvement in the Cyano. I have since seen a large improvement by 1. shortening the lighting period by 1 hour and using a Kessil H80 to grow Chaeto in my Aquafuge. I also stopped using Coral Snow & Zeobak. If you are looking for a bacterial product, there may be other sources that are cheaper and as or more effective. The first time I used this product it surprised me on how dirty the water was. I use this twice a week and it keeps the tank looking like new. Make sure to do it after lights out, it will cloud the tank. This stuff works very well to remove cyano when you combine it with Zeobak. I let them mix together in a cup for 5 minutes before adding. I dose at night because it takes a while to clear back up. Make sure you have a strong skimmer, or you will not get the full benefit. For me it did not cause the skimmer to overflow, but improved the "sludginess" of the skimmate. I found that emptying and cleaning the skimmer cup after 24 hours helped, as the sides of the neck were caked with sludge. On the one hand, this product does significant'y increase clarity when dosed daily. I am now on my second 250 ml bottle. It has no effect on my tank's pH, but does increase the volume of skim mate. I use it to improve water clarity, together with Zeolife, because I cannot use activated carbon. That gives my Yellow Tang Lateral Line Disease. On the other hand, I occasionally fight cyano, and this product has no discernible effect on whether I do or don't develop or get rid of cyano. Does not bother me because I did not purchase it for that purpose, although it is advertised as cyano cure. As usual, Korallen-Zucht makes no disclosure of the ingredients, so you just have to try it to see if it works, and then speculate as why it does or does not. That's irritating, at least to me. With the combination of coral snow and cyano clean I've cleared up my cyano outbreak... But my turbo snails are not doing well. Every day I need to reattach half of them to the rocks. Not sure if it's from the kz products or posably a rise in nitrate from the cyano dieing. I like the K-Z products because I do not see changes in tank nutrient levels ;0) Use the Coral Snow along with other K-Z products such as Vitalty, etc. Good products from Germany! This does remove the yellow tinge in the water for me. But if you use it, be sure to use it at night or on a day when no one is going to come look at your tank. Also make sure your wife/significant other knows that you are doing something like this so they don't get worried on your part ("Nathan! something is horribly wrong with your tank! Come Quick!"). I don't know if I get enough out of it to spend the premium money on it again when I could use carbon. used this product for years with and with out Cyano issues, it was the only thing I would put in my tank for a long time. I have a pretty decent tank and thought this could hurt to try. Used for a few days and noticed a discernible difference in clarity. I always thought my water was crystal clear, but after using this it was amazingly clearer. It is a really interesting product. A capful will produce whiteout conditions in your tank for several hours, which is why they recommend you do it at night. It doesn't seem to negatively impact any corals or fish. Also I did notice that I had less cyano/brown algae when I was using this product once a week. Overall it works pretty well and leaves the water looking clear. I will probably buy it again. Can I use coral snow with a system that is useing biopellets? This will not have a negative impact on bio pellets. Feel free to let us know if you have any further questions! ZeoBak is typically only needed in conjunction with the Zeovit System and Zeolite media. Most zeo products are intended to be dosed into the Zeovit reactor directly and dilution beforehand will not be required. Feel free to let us know if you have any further questions. Could this be dosed in a skimmerless 10 gallon in a fashion similar to MB7 to reduce nutrient concentrations and increase clarity and if so what should I dose at? The KZ system does rely on a large skimmer being used and using coral snow without a skimmer could cause a muddy build up somewhere in your tank. Coral Snow is more of a mud/clay type filter system that definately helps clean the tank water and clear things up, but does rely on a skimmer to be exported eventually. People that use Coral Snow report that their skimmer gets a light muddy/clay like consistency after using it.